Alpacas are a lifestyle! A calm, peaceful, "kick your heals up and enjoy the day" kind of lifestyle. We are loving it and are sure you will too! We are located in Historic and relaxing Lava Hot Springs, Idaho. In a valley perfect for raising Alpacas. We are just two hours from Jackson Wyoming, the entry to Yellowstone Park. Come visit our Farm, stay at our "Alpaca Inn" and enjoy a soothing hot mineral soak or a lazy drift down the river. Our focus has been centered around breeding for Outstanding Quality, for healthy animals, superior fleece, sound confirmation, easy birthing and good milk production. We enjoy and appreciate color, but high quality alpacas come first. 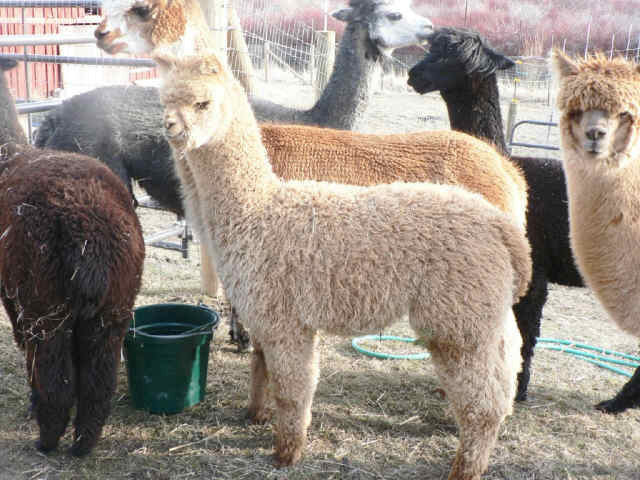 We'd be happy to show you around the farm, sell you an alpaca or two, or board your alpaca's here on our grassy 10 acres just outside of Lava Hot Springs, Idaho. All sales come with a free breeding, and free boarding for 6 months. We are a working farm. We are not a petting zoo. Visitors must be accompanied with Londa or Jody. Please call for an appointment.